Echo automates the recording and delivery process. The dashboards are easy to use and their LTIs work well. The first problem is that lecture recording does not have a way to alert the speaker if their microphone is not being picked up. Without audio the recording is useless. Once a decent recording is loaded there are very minimal editing options. Echo360 allows us to increase class size and still provide lectures to off-campus students. It also makes lecture recording and LMS delivery more feasible for faculty of all technical abilities. 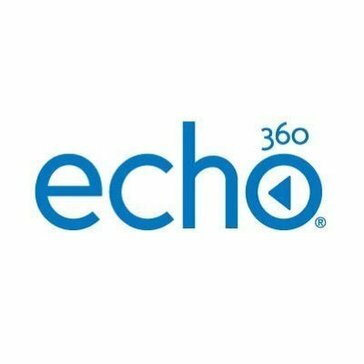 "A complete lecture capture system"
Echo360 maintain an aggressive roadmap, and for the most part deliver the goods. While their design decisions haven't pleased everyone (which is impossible to do) they have an impressive track record in getting it right, which gives me confidence. The baseline product is a little expensive. The UI could be a little more mobile friendly. If you need classroom capture, Echo360 is the best product we've found. Echo360 allows my organisation to deliver rich video and interactive content to students. * We monitor all Echo360 reviews to prevent fraudulent reviews and keep review quality high. We do not post reviews by company employees or direct competitors. Validated reviews require the user to submit a screenshot of the product containing their user ID, in order to verify a user is an actual user of the product. Hi there! Are you looking to implement a solution like Echo360?